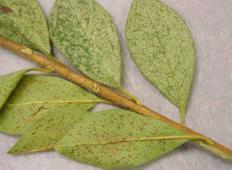 Host: Very common on azaleas in the southeast. Worst infestations tend to occur in sunny areas. Pest Description & Cycle: (see photo 1 below) Adults are 1/8 inch long. The transparent wings are held flat on the back. Their wings are lacy with two grayish-brown cross-bands connected in the middle. Nymphs are mostly black and spiny. The flask-shaped eggs are partially embedded in leaf tissue and often are covered with a black tar-like secretion.There are four generations a year. Eggs overwinter in leaf tissue. 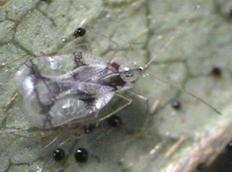 Lace bug adults and nymphs live and feed on the underside of leaves. Management: Time insecticide applications for the presence of the first generation nymphs. The Georgia Pest Management Handbook lists acephate (Orthene TTO) at 1 tsp./gal Apply in early spring when nymphs of first generation are present. Also - imidacloprid 1.47% (Bayer Advanced) Apply as per label directions.